I recently bought my daughter some Skechers Luminators. They are awesome! Over 10 light modes on these rechargeable light up kid shoes including solid and strobe modes. 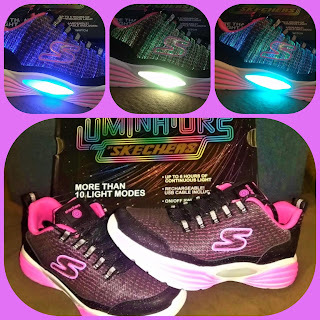 These Skechers Luminators last up to 6 hours on one charge and come with a USB charger. I wish I would have waited due to I paid full price as they were not on sale when we went school shopping. Best deal is 25% off when you purchase $100 or more if not you only get 15% which is still a great deal on these. FREE shipping on $99+ orders after discounts. You can pretty much get these for BOGO free if you purchase 2.